My mom loves salmon, but she’s not confident when it comes to cooking it. I assure her how easy it is. 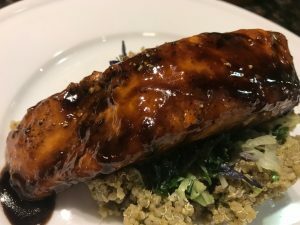 My husband and I went over for dinner one night and we made this grilled lemon balsamic salmon together. Super easy, super delicious, and a super win for all of us! 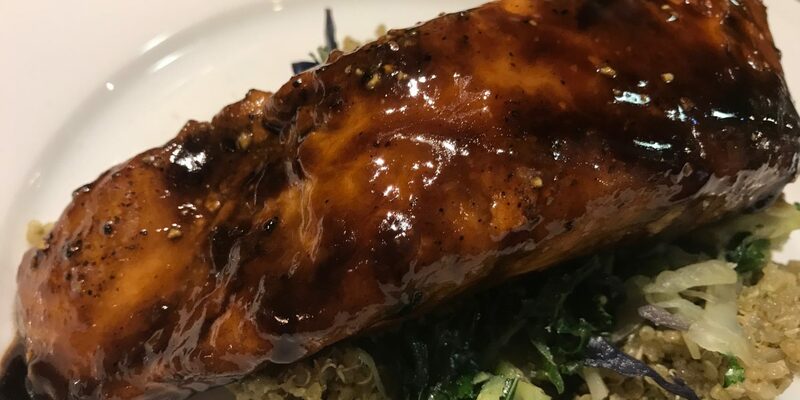 Being a fatty fish, salmon is forgiving. This makes is a great fish to start with if you’re new to fish cookery. Cooked well, I love salmon simply seasoned with olive oil, sea salt and pepper. But, like any protein, you can easily step up the flavor with a few simple tricks. The more high quality balsamic vinegar you use, the better flavor you will get out of this recipe. I buy mine at olive oil and vinegar bars, like Cardena’s in Philly. Marinade skin up, flesh side down. 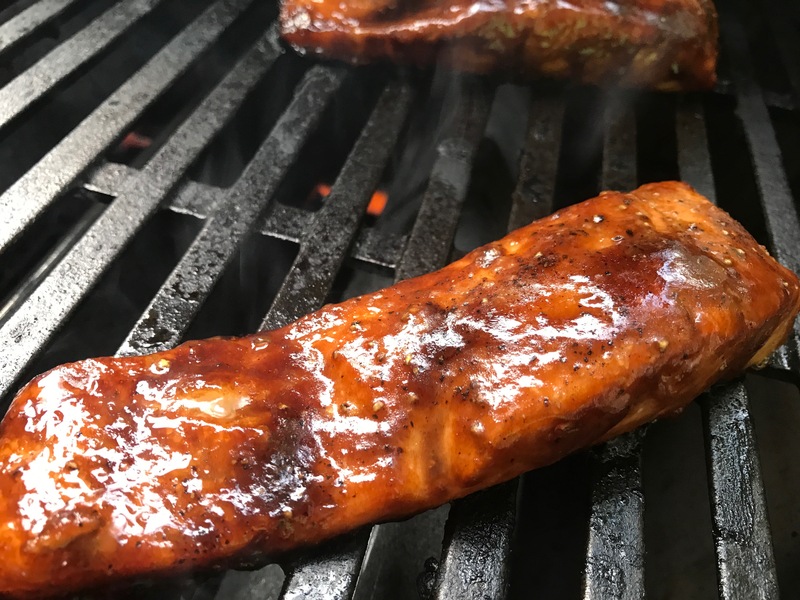 Pat your salmon dry before you season it or put it in a marinade. This is super important! 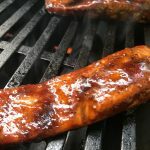 Any excess water will dilute the flavor you attempt to add and prevent the marinade from soaking in as well as it could. Marinade skin up. Soak the fleshy part of the salmon in the marinade. Balsamic vinegar has lots of natural sugars, so it can scorch on the grill if it cooks too long. 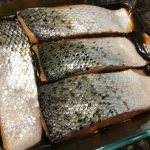 If your salmon skin is covered in it, it will likely burn. Leave the skin on and grill skin side down. Don’t move it until it’s done! Always season with salt and pepper after soaking in the marinade and before grilling. The salt helps all the flavors come out and the pepper adds flavor. Leave the skin on and grill skin side down. This protects the fish. Your skin will get super crispy, and you can eat it if you like, and if not, it will easily come off, leaving you with flaky, juicy, tender fish. Temp your salmon. On my grill, 6 oz fillets take 7 minutes to cook, like clock work every time. I cook mine to 135-140F, or medium. I suggest cooking no higher than that or your fish will likely be overcooked. Let your salmon rest 5 minutes before serving to allow the fish to retain its juices. Cut salmon into 6 oz fillets. Leave skin on. Pat it until it's completely dry. In a 9"x11" baking dish mix the lemon zest (or oil), olive oil and vinegar with a whisk until completely homogenized. Reserve 2 TBS and set aside in a small covered bowl. Put the salmon into the baking dish into the marinade skin side up (so the meat of the salmon is soaking in the marinade). Marinade for 20-30 minutes. You can leave the salmon out. Preheat your grill 15 minutes before grilling. Remove salmon from marinade and place onto a baking sheet skin side down. Salt and pepper the tops and sides of the salmon fillets. Place on the grill skin side down. Grill for 7-8 minutes or to 135-140F for medium doneness. 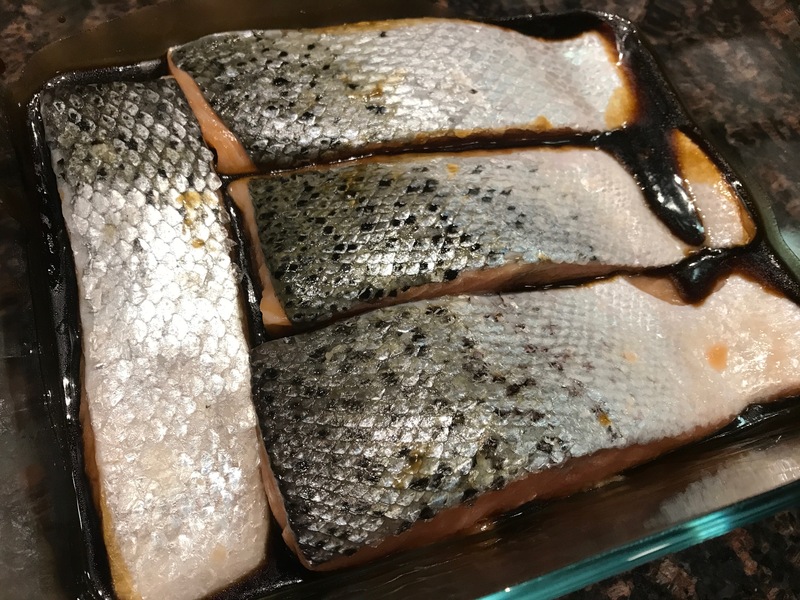 You can cook for less time to 130F if you like your salmon closer to medium rare, or cook longer to 155-160F if you like your salmon more done. Remove from grill. Often the skin will come right off and stay on the grill. This is fine. I remove it before serving if it doesn't. Baste with reserved marinade for extra flavor and moisture if desired.